Yeah, I wish.. Still, a girl can dream, can't she? I've been spending the last few days having a ball selecting outfits to wear to the royal wedding. Having made up my mind atlast, I present to you, my look if I had the invite.. There you go.. 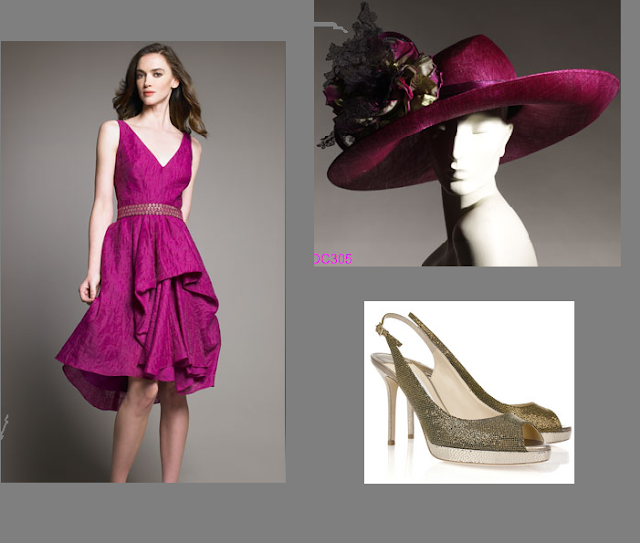 I would be wearing this stunning and too perfect for words fuchsia dress from Lela Rose. I would be on trend wearing this dress from the spring collection. The dress has a beautiful structural pleat in the skirt. Its full skirted which is my favourite and it has a beautiful gauze belt to nip you at the waist. When I'm standing in a room full of royalty, the only way I could hope to stand out is with a hat. Not just any hat.. This amazing and absolutely lustworthy hat from Philip Treacy. The beautiful hat has a floral detail with plum and green petals. I would pull together this look with the bronze glitter sing-backs from Jimmy Choo. The green of the hsoes tie in beautifully with the green petals of the hat. I would add in simple studs and be free of jewellery and leave my hat to do all the talking. What do you think? Good enough for royalty? ?